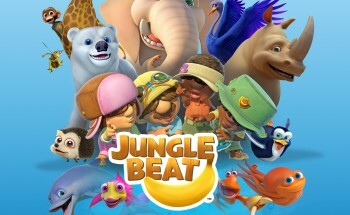 The wacky animals from the wonderful world of Jungle Beat are embarking on a whole new adventure in the Jungle Beat mobile game! When Baby Ostrich tumbles into a raging river and is swept away into the depths of the jungle, it’s up to the other animals to form a rescue party. Their journey takes the form of a puzzle platformer, filled with colour and energy and, of course, the bravery and brilliance of your favourite Jungle Beat friends! Every animal has their own special skill, but it’s only by working together that they’ll be able to bring Baby Ostrich back home safely. Path blocked by an obstacle? Don’t fret – you can zap it out the way with Firefly’s laser beam, or bash it with a bouncing boulder launched by Elephant. Got a gap to cross? Giraffe has you covered. Those long legs and neck are not just for reaching the tops of trees – instead, he takes planking to a whole new level! You can swim with Frog, hide in watermelons with Baby Ostrich, or swing from vines with Monkey. You can float in giant bubbles, or burst them with watermelon seeds shot by Elephant and Baby Ostrich. And if you want to fly, you can soar through the air with Firefly, or get carried away on her rainbow tractor beam. What a ride! The animals must cross rivers, mountains, deserts, jungles and midnight forests. The way may be tricky, but there are lots of secrets to discover, and plenty of new friends to meet along the way. You can play the game any way you’d like – take your time solving the puzzles, collect all the fruit and objectives, or rush through to beat your best time! Either way, you’ll be challenging your fingers and your brain on an adventure that’s as wild as its heroes. 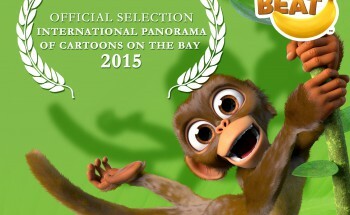 Good luck, and beware – it’s a jungle out there!